A Lauder hotelier is having another go at convincing councillors to allow his premises to remain open for an extra hour to let his customers celebrate the town’s annual common riding for longer. Daniel McKay, boss of the Lauderdale Hotel in Edinburgh Road, is currently licensed until 1am at weekends, but to mark the royal burgh’s big day on Saturday, August 6, he wants to sell alcohol until 2am the following morning. That would give his hotel parity with the annual Lauder Common Riding Ball, held, since 2013, in a marquee in the town’s public park. Last year, a similar bid by Mr McKay was rejected by five votes to two by Scottish Borders Council’s licensing board after objections were submitted by the police and the board’s own licensing standards officer. The police are again objecting to Mr McKay’s new application, due to be considered by the board tomorrow. 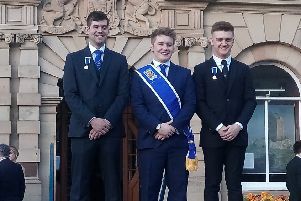 On behalf of Police Scotland’s chief constable, Phil Gormley, officers say the requested late bar has no connection with the actual common riding, that being accepted as being a special event of local significance. “This appears to be purely to facilitate late drinking on the premises,” states the police submission, noting that no other licensed premises in the town will be open beyond 1am. In his letter of objection, licensing standards officer Mike Wynne, a former policeman, states: “There is no doubt that having one of the licensed premises open an hour later than the others could prove problematic. Mr Wynne and the police have also lodged objections to a bid for an occasional licence by Hawick Conservative Club for a live music event it proposes to hold between 3pm and 9pm on Saturday, August 13, in the courtyard behind its premises in Croft Road. Both submissions cite the proximity of residential properties and the resultant potential for noise complaints and public nuisance.